We are very excited and proud to present to you our on-line catalogue offering of flowers and fine gifts & gourmet foods. We are certain you will find the ideal gift or flower arrangement to show your appreciation and affection for those special people in your life. 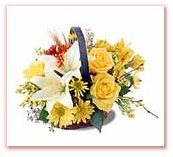 All of us here at Pam's Flower Garden are dedicated to serving your every gift giving need. We offer friendly and efficient customer service as well as user-friendly websites. We take great pride in making sure each and every gift or arrangement arrives in beautiful condition. Our baskets are filled to overflowing with the most delicious gourmet specialties such as: chocolates, cookies, cheeses, nuts and other mouth watering treats. Every gift is hand made, hand packaged and every bow is hand made and hand tied with the utmost care. All of our gifts and flowers are backed by our "Commitment to excellence" guarantee and 46 years of experience, quality and integrity.